Please click to select your favorite GPS app that is on your device. to Congregation Torat El for MLK Interfaith event Wednesday January 16, 2019 at 7pm. to Trinity A.M.E Church for Gospel Night Thursday January 17, 2019 at 7pm. to Portuguese Club of Long Branch for MLK Soul Food Dinner Friday January 18, 2019 at 6pm. to Long Branch Free Public Library (at far back left of parking lot) for MLK Day of Service Project, Saturday January 19, 2019 from 11am - 1pm. to Rev. Martin Luther King Monument Park for ceremony and march to Second Baptist Church Sunday January 20, 2019 at 2pm. to Second Baptist Church for MLK celebratory church service Sunday January 20, 2019 at 3pm. to Rev. Martin Luther King Monument Park for MLK birthday observance Monday January 21, 2019 at 9am. to Long Branch High School gymnasium for MLK basketball tournament Monday January 21, 2019 from 10am to 2pm. 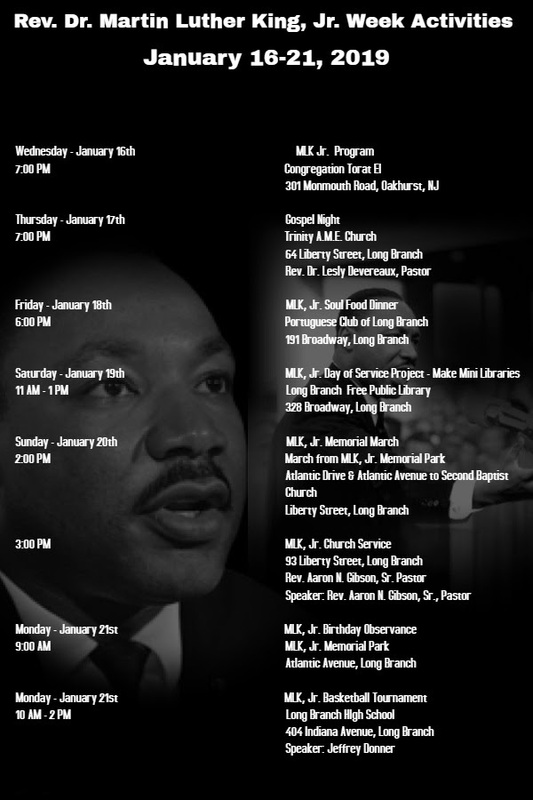 Please be welcome and enjoy any or all events during the MLK celebration week.